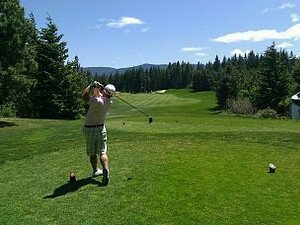 The game of golf as we know it today originated in the 1400s in Scotland but the first relations of the game go back as far as the first century B.C. In 1457 King James II of Scotland outlawed the game as an unwelcome distraction and no doubt many golf widows and widowers wish it had remained so. Regarded as the home of golf, the Old Course at St Andrews was established in 1552. Although Musselburgh Links is officially recognised as the world’s oldest course and dates from “just” 1672, there is no doubting golf is a sport with serious history and a seriously intimidating set of rules. The object of the game is simple enough: to get your ball from the tee (the starting point of any hole) to the green and ultimately into the hole in as few shots as possible. “The hole” refers both to the physical hole marked by a flag into which the ball must be sunk and also the entire area from the tee to the green. This may be considered one unit of the course, with a standard course consisting of 18 separate holes played in turn. Golf is usually played individually, with a professional tournament generally consisting of around 80-160 players playing in groups of three or four, competing against each other. There are also team tournaments, the most notable being the Ryder Cup played between Europe and the USA. In this format 12 players from each side compete in a mixture of singles matches, played one against one, and doubles, two against two. The equipment used in golf is highly regulated, with exact specifications for almost everything, from the exact make and model of clubs that are allowed, to the size and shape of the grooves on their face (the surface with which the ball is hit), to the precise weight and aerodynamic capabilities of the ball. Due to the fast pace at which technology is improving this has been a difficult area for the governing body, the R & A, to regulate. Players are only allowed to carry and use 14 clubs during any one round and in addition to the clubs and ball the players normally wear a glove on their left hand (for right-handed players) and also use tees, small pegs, to elevate the ball for the first shot on any given hole. Confusingly the part of the course the first shot is made from is also called the tee and golf is unusual among ball games in not having a standardised pitch or playing area. Although all courses will have the same features, such as tees, greens, fairway and hazards, the exact layout and size varies, making each course unique, which is very much part of the game’s allure. The most common scoring method in golf is called stroke play, where the total number of shots a player takes to get the ball into each hole is added together. At amateur level this is usually over one round (set of 18 holes) whilst professionals normally play four rounds, starting on a Thursday and finishing a tournament on the Sunday. The score is expressed in terms of under or over par. Par is the number of shots a good golfer (someone playing off “scratch”, or a handicap of zero) would expect to complete a given hole in, with one always allowed for the tee shot and two putts (shots played on the smooth, prepared area around the hole called the green). Being under par is a good thing as you have completed the hole in fewer shots than expected. Apart from stroke play the other main scoring method is match play. Under this system whoever completes each hole in the least number of shots wins that hole or if it is level the hole is “halved”. The overall victor is the one who wins the most holes, with results normally expressed as “3 & 2” for example, meaning one player was three holes in front with only two left to play. In addition there are also Stableford, skins and other scoring methods but these are predominantly only used in amateur play. Most pro events, including all four of the game’s Majors (the biggest, most valuable, prestigious tournaments each year) use the stroke play system. Events are held over four days and the winner is the player who completes 72 holes (four rounds of 18, almost always on the same course) in the fewest number of shots (also called strokes). The ball must be hit using standard clubs from the start of each hole to the green and ultimately into the hole, which is marked by a flag. Players strike the ball in turn with the furthest away from the hole going first. At the start of a new hole whoever took the least shots on the preceding hole shall go first. The penalty for a lost ball is one stroke and this includes balls struck out of bounds (off that particular hole) or into water hazards. You have five minutes to search for your ball and the penalty is both stroke (one shot) if the ball is lost and additionally distance (you play again from your original starting point) if it goes out of bounds or into the water. Players can only use up to 14 clubs. Players cannot seek advice from anyone other than their partner or caddy. The ball should be played as it is found – you must not move, break or bend anything fixed or growing, other than to assume your normal stance, to improve the lie of the ball, your line of site or your area of swing. On the putting green a player can mark, lift and clean his ball so long as it is replaced exactly where it was. He or she may also repair ball marks or hole plugs but not spike marks that are on the putting line.